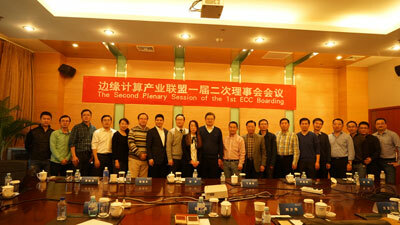 On the afternoon of February 24, 2017, the second session of the First ECC Council was held in Beijing. Attendees included: Yu Haibin, Director of Shenyang Institute of Automation of Chinese Academy of Sciences, the entity that assumes the roles of executive director and chair of the ECC; Yu Xiaohui, Chief Engineer of Technical Standards Institute of Chinese Academy of Information and Communications Technology; Liu Shaowei, Manager of Huawei Network R&D Department; Fang Fahe, Vice President of Strategic Cooperation Department of iSoftStone; Zhang Yu, CTO of Intel Corporation's IoT Service Department in China; Yin Xiaobing, Sales Director of IoT Application in China Region of ARM Holdings; Wang Hongyu, Vice President of Strategic Cooperation and Key Projects Department of Siasun Robot & Automation Co., Ltd.; the secretary general, deputy secretary general, and chairmen of working groups. At the conference, the council deliberated and adopted the proposal of adding Automation College of Chongqing University of Posts and Telecommunications, Beijing Tianwang Online Communication Technology Co., Ltd., and Advantech Co., Ltd. as three new consortium members, the establishment of cooperation with organizations, and the founding of industry working groups and local subcommittees. Additionally, attendees at the conference discussed the key work and orientation of the ECC in 2017, and determined the key work and objectives of test beds, ECC white paper 2.0, technology white paper 1.0, and so forth.